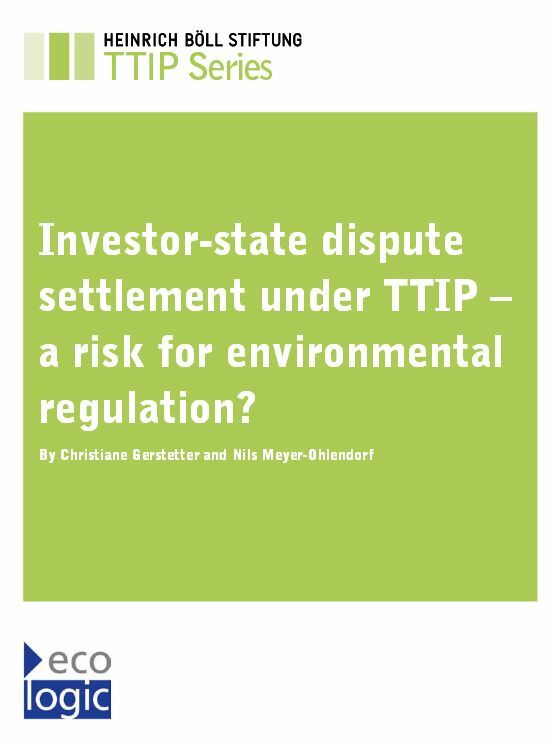 Investor-state Dispute Settlement under TTIP - a Risk for Environmental Regulation? In this study for the Heinrich Böll Foundation, Christiane Gerstetter and Nils Meyer-Ohlendorf of Ecologic Institute look at the "I" in TTIP, investment rules in the Transatlantic Trade and Investment Partnership under negotiation between the US and the EU. They assess the impact of investor-state dispute settlement (ISDS) rules on environmental regulation by analysing existing case law. ISDS is a system that allows private investors to sue a host state for the alleged violation of an international investment treaty concluded between that host state and the investor's country of origin. The authors conclude that rules on ISDS are not necessary in an agreement between two highly evolved, rule of law legal systems. By contrast, such rules create significant risks for environmental regulation, because of the broad wording of investment rules and the largely unpredictable manner in which they are interpreted by investment tribunals. States may have to compensate investors for taking legitimate environmental measures. The study recommends not to include such rules in TTIP. The EU Commission's negotiating mandate for TTIP and the US model bilateral investment treaty both indicate a preference for including ISDS in TTIP. There are a number of clauses routinely contained in investment treaties that have the potential to restrict the right of governments to take environmental measures: the requirement of "fair and equal treatment" for investors, a prohibition on "(indirect) expropriation", and the so-called umbrella clause. All of them are often broad and vague in wording, and; the case law interpreting them is not consistent. Although investment tribunals never invalidate environmental regulations, nor have any similar direct impact on national environmental policies, they have – in some cases – awarded considerable compensatory payments to investors for a violation of the above clauses. The inclusion of any of these norms in TTIP would not automatically prevent the US or the EU from adopting environmental measures in the future, nor would they necessarily have to pay compensation to investors whenever doing so. However, the results of ISDS proceedings are unpredictable. Some arbitration tribunals have taken a restrictive approach to governments’ regulatory freedom; others have deemed government regulation not to violate investment law. These uncertainties result in considerable risks for environmental regulation which are exacerbated by the fact that investment-related provisions tend to be interpreted broadly in ISDS proceedings. There are no strong arguments for including ISDS rules in TTIP. Both the US and the EU have highly evolved, efficient rule of law legal systems. There is no evidence that investors have ever lacked appropriate legal protection through these systems. There is no bilateral investment treaty between the US and any of the old EU Member States, and yet US and EU investors already make up for more than half of foreign direct investment in each others' economies. This demonstrates that investors seem to be satisfied with the rule of law on both sides of the Atlantic. ISDS provides foreign investors with an additional judicial remedy not available to domestic competitors. Furthermore, the sheer size of foreign direct investment could lead to a considerable number of investment disputes. As a consequence, large numbers of disputes that normally would be adjudicated in domestic courts would be subject to international arbitration, bypassing domestic judges that have been elected or appointed by elected officials. Such rules could have a significant chilling effect on government’s willingness to adopt environmental and other regulation. However, in the event that provisions on ISDS are nonetheless included in TTIP, this paper provides suggestions on how to formulate such provisions in order to mitigate the risk to environmental regulations. TTIP: Hope or Hype – or a Risk to the Environment? Gerstetter, Christiane und Nils Meyer-Ohlendorf 2013: Investor-state Dispute Settlement under TTIP - a Risk for Environmental Regulation?, Heinrich-Böll-Stiftung: Berlin. 3.2 Phrasing rules on investment protection differently – a solution?